It is very important to follow grammar rules to communicate effectively. One of the many parts of speech that adds meaning to a sentence is the verb tense. When verb tense is used incorrectly, sentences sound very confusing! Verb tenses do not only apply to action verbs. Linking verbs, like “is” and “are,” also have past forms, which are “was” and “were,” respectively. These verbs are not interchangeable as their usage depends on the subject. This article will discuss the difference between the two. Singular nouns. For example: The test was really easy! First person singular pronouns. For example: I was watching TV when you called. Third person singular pronouns. For example: It was very nice to see you at the party last night. Singular indefinite pronouns (everybody, anybody, somebody, everyone, anything, everything, something). For example: Everyone was so kind and helpful. Singular countable quantifier pronouns. For example: Well, one was able to get away. Uncountable quantifier pronouns (enough, little, less). For example: Little was known about the life of Edward Smith. Second person singular and plural. For example: Were you happy with the results? First person plural. For example: We were tired of waiting, so we left. Third person plural. For example: They were so rude to that poor guy. Plural indefinite pronouns. For example: Both were lovely! Plural countable quantifier pronouns (few, many, more). For example: Many were against it. 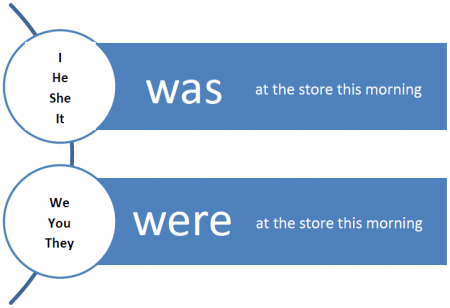 What, then, is the difference between was and were? “Was” is the past tense of “is” while “were” is the past tense of “are.” The verb “was” is generally used for singular and uncountable subjects, both nouns and pronouns. On the contrary, the verb “were” is used when the subject is plural. Additionally, the verb “were” should be used with the pronoun “I” if it is used in a subjunctive mood, or if the statement talks about something that is not real or just hypothetical. “I” should be paired with “was” if the statement talks about a fact.